If current growth rates continue for another decade or so, China will outpace the US by the end of the 2020s, and the Asia Pacific Region will be able to steer world economic development and dictate the global political agenda. This is why Russian Prime Minister Dmitry Medvedev’s participation in the APEC forum is of strategic importance, considering that the APEC heads of state and government discuss pressing global and regional issues at their meetings. The shift in economic power towards the Indo-Pacific Region has been among the most consequential trends since the early 2000s. As early as 2013, the Asian countries were ahead of the US in terms of their aggregate nominal GDP. The IMF estimates that in 2018, Asia accounts for 35.4% of global GDP, with the US coming second (23.3%), and Europe third (22.8%). The Ninth Asian Regional Conference of the Valdai Discussion Club, titled “A Changing Asia in a Transforming World,” will be held in the Malaysian capital Kuala Lumpur on November 21-22, 2018, on the heels of the meetings of ASEAN, APEC and the East Asian Summit. Another no less important and remarkable trend of the 21st century is the so-called “digital revolution” unfolding, albeit at different rates, throughout the world. Increasingly predominant in the economy, information and information technologies are emerging as an important production factor influencing the competitiveness of both individual corporations and countries as a whole. Since Russia will not become a “world factory” like China anytime soon, nor a world financial center like the US, developing digital technologies and products to diversify an economy that leans heavily on the raw material sector would best advance Russia’s interests. Russia and the countries of Asia, where the digital economy will also help to ensure sustainable growth for the foreseeable future and where investment in information technologies and artificial intelligence grows with each passing year, can become priority partners for each other, particularly against the background of the increased China-US and China-EU rivalry in this sphere. The conclusion of digital economy agreements by Russia and a number of APEC countries will determine the success of the summit in Port Moresby (Papua New Guinea) for Russia. The de-globalization and growing US protectionism inaugurated by Donald Trump, accompanied by corresponding political and economic processes and trade wars, with soft power replaced by hard power, constitute yet another important trend, namely, regionalization and the diffusion of military and political power. The Indo-Pacific Region will not escape this fate either, what with the US attempting to establish an “Asian NATO” within the framework of the so-called Quadrilateral Security Dialogue, or Quad, involving itself, Japan, Australia and India. The Quad’s activities were suspended several years ago because of Australia’s reluctance to quarrel with China, its main trade partner. The US is seeking to revive the group, as demonstrated by the fact that US, Australian, Indian and Japanese senior officials held a meeting on the sidelines of the ASEAN summit two days before the APEC summit in Port Moresby. During the summit, the US announced that it would cooperate with Australia and Papua New Guinea and upgrade its Lombrum Naval Base on Manus Island, turning the facility into another strategic US outpost in the Pacific. Among other things, the APEC consultative forum was set up in 1989 to protect the multilateral trade order, which dovetailed with the WTO’s basic principles. But the United States has embarked on a course of upending international rules and trade principles. Its insistence on APEC members publicly criticizing the WTO and stating in a declaration that the WTO doesn’t work and needs to be overhauled, met with strong resistance from China. As a result, only an abridged final communique was signed. Yet another potentially dangerous trend is the growth of US-China disagreements that clearly manifested themselves at the APEC summit. Vice President Mike Pence, who led the US delegation, went on record as saying shortly before the summit that the US would launch a “cavalry attack” on China’s “authoritarianism and aggression.” The Chinese delegation could hardly be pleased with his statement that “we [the US] don’t drown our partners in a sea of debt” and that the APEC states should not borrow from China, which continues to expand its influence and investment in the region. 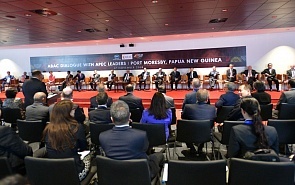 Thus, the success of the Papua New Guinea summit was in question a whole week before its opening. The fact that the US and China failed to come to terms on a final declaration and the WTO is evidence that the trade war between them will continue. The summit revealed not only the inability of the two biggest world economies to reach an agreement but also the stirrings of a new cold war whose epicenter is shifting to the Indo-Pacific Region.